The Padley Group is one of the most well-respected charities operating in Derby focussed on supporting the homeless, vulnerable and needy. They operate 365 days a year, offering rooms, food, education and training to those who, for a whole variety of reasons, have fallen on very difficult times through mental illness, learning disability, relationship breakdowns, or other personal vulnerabilities. This is not a charity for chancers, professional beggars, or freeloaders – they’ve been around too long to be duped in that way. They care very much for the people that they help, and they will do their best, but they are very mindful of ensuring that the great support that they receive is not frittered away. 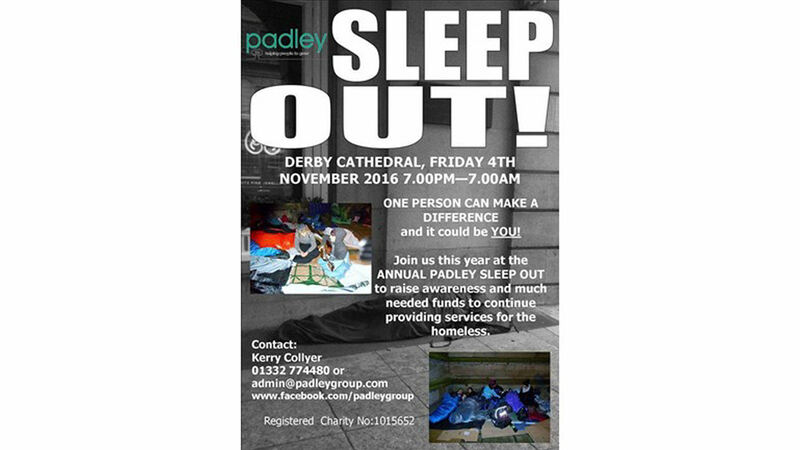 On November 4th – around 30 supporters of Padley will be sleeping out, over night by the Cathedral, in a fund-raising exercise and to show solidarity with those who genuinely have nowhere to go…and this is always more poignant when the nights are long and cold. Derby News has around 4000 followers, £1 from each would hit their notional target for this event – any more would not got to waste. I have kick-started the campaign from this site, and donated to the following link.